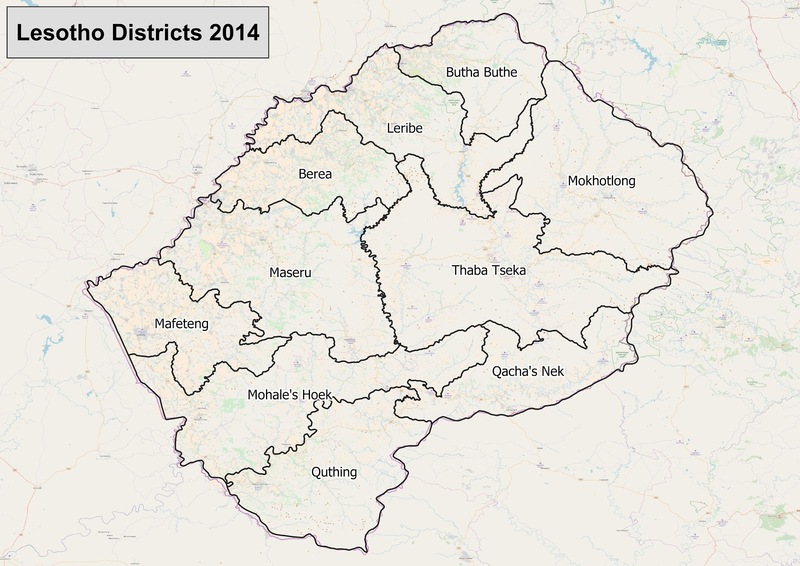 Lesotho is divided into ten districts. The size (in square kilometres) and 2016 population estimates of these districts as well as their capitals are shown in Table 1 and their locations are shown in Figure 1 (Lesotho Bureau of Statistics 2018). Lesotho’s population grew between 1996 and 2016, however, the population grew at a much faster rate between 2006 and 2016 (7%) than it did between 1996 and 2006 (0.8%) (Table 2) (Lesotho Bureau of Statistics 2018). Lesotho’s population growth rate over the whole period can also be attributed to Lesotho’s total fertility rate (the average number of children born per woman) even though it decreased from 4.1 children per woman in 1996 to 3.2 children per woman in 2016 (Lesotho Bureau of Statistics 2018). In spite of the increases in the size of the national population, not all of the district populations in Lesotho grew between 1996 and 2016 (Table 2) (Lesotho Bureau of Statistics 2018). In fact, between 1996 and 2006, the populations of the Leribe, Mafeteng, Mohale’s Hoek, Quthing and Qacha’s Nek Districts shrank in size, while between 2006 and 2016, the populations of the Mafeteng, Mohale’s Hoek and Quthing Districts continued to shrink in size (Lesotho Bureau of Statistics 2018). These negative growth rates of District populations may be partially attributed to the significant growth rates of urban areas from 1996 to 2006 (43.8%) and 2006 to 2016 (62.7%) as well as inter-district migration (Lesotho Bureau of Statistics 2018). The big change in the national population growth rate between 1996 and 2006 (0.8%), and 2006 and 2016 (7%) may be attributable to greater access to antiretroviral medications (and thus fewer HIV/AIDS-related deaths) and better data collection. Lesotho has one of the highest rates of HIV/AIDS in the world (Ministry of Health and Social Welfare 2016; CIAT and World Bank 2018; Gwimbi et al. 2013; FAO 2005). In 2015, it was estimated that 25% of Lesotho’s population were HIV positive (Ministry of Health and Social Welfare 2016; CIAT and World Bank 2018; Gwimbi et al. 2013; FAO 2005). However, the percentage of HIV-positive people (adults and children) receiving antiretroviral treatment in Lesotho increased from an estimated 6% in 2006 to 42% in 2015 (Ministry of Health and Social Welfare 2016). Furthermore, the big change in the national population growth rate between 1996 and 2006, and 2006 and 2016 may also be partially attributed to the overall decrease in Lesotho’s infant mortality rate (the number of deaths per 1,000 live births of children under one year). While Lesotho’s infant mortality increased from 74 deaths per 1,000 live births in 1996 to 94 deaths per 1,000 live births in 2006, it decreased thereafter to 53 deaths per 1,000 live births in 2016 (Lesotho Bureau of Statistics 2009, 2018). Additionally, Infant and child mortality rates in Lesotho are lower in urban areas than in rural areas and the size of the population living in urban areas has grown significantly between 1996 and 2016 (Lesotho Bureau of Statistics 2018). Moreover, there are strong links between the infant mortality rate and the level of education attained by the mother – higher levels of education are linked to lower levels of infant mortality (Lesotho Bureau of Statistics 2018). Lesotho’s government spends approximately 14% of its available public funds on education (UNDP 2017). The results of this spending can be seen in Lesotho’s national literacy rate, which in 2016 was estimated to be 97% (Lesotho Bureau of Statistics 2018). Additionally, Literacy rates in Lesotho are estimated to be higher for women (98.6%) than for men (90.6%) (UNDP 2017). Linked to literacy rate are the levels of education achieved by the population. For both primary and secondary school, the rate of enrolment is higher for girls than for boys (UNDP 2017). Enrolment in secondary school is 22% for boys and 36% for girls (UNDP 2017). For Basotho aged 15 and over in 2011, Table 3 gives a breakdown of the highest level of education achieved (Lesotho Bureau of Statistics 2013). Table 3 shows that 52.17% of Lesotho’s population have some or completed primary schooling in 2011, while 33.25% have some or completed secondary schooling, and 1.87% have earned a post-school qualification (Lesotho Bureau of Statistics 2013). A further 9.92% of Lesotho population (15 and older in 2011) gave their education level as ‘Not applicable’, ‘None’, ‘Non-formal education’ or ‘Other’ (Lesotho Bureau of Statistics 2013). Access to education and the quality of education are limited in Lesotho by poverty, insufficient early childhood development and education, misallocation and inefficient use of financial resources, and corruption and mismanagement of educational resources and organisations (UNDP 2017). Linked to education is employment. In Lesotho, the working-age population (classified as those aged ten and over) constituted an estimated 1,481,652 individuals in 2011 (Lesotho Bureau of Statistics 2013). This was equal to approximately 78.22% of Lesotho total population at the time (Lesotho Bureau of Statistics 2013). Of the working-age population, an estimated 36.21% were employed, 3.36% were unemployed and the remaining 60.43% were classified as ‘not economically active’ (Lesotho Bureau of Statistics 2013). Similarly to South Africa, it can be deduced that Basotho who are unemployed and who are not actively seeking work are included in the ‘not economically active’ classification (Lesotho Bureau of Statistics 2013). It is estimated that 75.22% of Lesotho’s working-age population live in rural areas, while the remaining 24.78% live in urban areas (Lesotho Bureau of Statistics 2013). Furthermore, according to the Lesotho Bureau of Statistics, unemployment is marginally higher in urban areas (3.40%) than in rural areas (3.34%) (Lesotho Bureau of Statistics 2013). Additionally, the percentage of the working-age population classified as ‘not economically active’ was higher in rural areas (63.42%) than in urban areas (51.36%) (Lesotho Bureau of Statistics 2013). Given the high levels of poverty (an estimated 60% of the population live below the poverty line in Lesotho) and malnutrition (30% of the population are vulnerable to food insecurity), the unemployment rate in Lesotho (as calculated by the Lesotho Bureau of Statistics) does not give full picture of the situation (CIAT and World Bank 2018; Mekbib et al. 2017; World Bank 2016; Ministry of Local Government and Chieftainship Affairs 2015; Gwimbi et al. 2013). Other evaluations estimate that Lesotho’s unemployment rate has fluctuated between 23% and 28% over the last decade (up until 2018) (Damane and Sekantsi 2018; The World Bank 2018). The large difference between the unemployment rate estimated by the Lesotho Bureau of Statistics and other evaluations may be due to the use of a broader definition of ‘unemployment’ by the other evaluations that includes individuals who are unemployed, not actively seeking work, and not at school or university. Many young Basotho migrate to South Africa for work, notability in the mining and construction industries (Ministry of Local Government and Chieftainship Affairs 2015; CIAT and World Bank 2018). In 2011, it was estimated that 135,285 Basotho were living in South Africa (Lesotho Bureau of Statistics 2013). Migration of Basotho to South Africa is so substantial that it has made Lesotho one of the most migration-dependent countries on Earth (UNDP 2017). It is estimated that money sent back to Lesotho, from Basotho working in South Africa, accounted for about 25% of Lesotho gross domestic product in 2009 (UNDP 2017). However, a Gini coefficient of 0.53 in Lesotho indicates that income distribution in Lesotho is not equal (UNDP 2017). This is one of the ten highest Gini coefficients in the world, although it is still lower than South Africa’s Gini coefficient of 0.66 (UNDP 2017; Bhorat 2015). More men have migrated to South Africa than women. Infant mortality is higher in males than females. Life expectancy is higher for women (59.5 years in 2016) than for men (51.7 years in 2016). Even though there are more females than males in Lesotho, a household is twice as likely to be male-headed than female-headed (Ministry of Local Government and Chieftainship Affairs 2015). This may partially be due to absent males (those that have migrated for work) still being considered the head of the household (Ministry of Local Government and Chieftainship Affairs 2015). Lesotho is a largely patriarchal society and gender inequality is an issue (UNDP 2017; Ministry of Local Government and Chieftainship Affairs 2015). Women are more likely than men to face gender-based violence (which seems to be increasing), and the are also more likely to be poor, unemployed and HIV positive (UNDP 2017). In 2014, it was estimated that 86% of Basotho women face gender-based violence in their lifetimes (UNDP 2017). Furthermore, drought-induced gender-based violence is a common occurrence in all ten districts in Lesotho (UNDP 2017). Gender inequality in Lesotho also occurs from inter alia childhood marriages, cultural practices that prevent women from inheriting property, unequal control and access to economic opportunities, unequal access to resources, sexual violence, and the persistence of traditional gender roles and cultural norms (UNDP 2017). Despite this gender inequality, women account for the majority of the agricultural labour force and their contributions to economic development and sustainable livelihoods in Lesotho is substantial (UNDP 2017). An example of the gender inequality in Lesotho is that until the Legal Capacity of Married Persons Act of 2006 was enacted, women were not allowed to own fixed property under Lesotho’s customary law except through their husbands (Ministry of Local Government and Chieftainship Affairs 2015). Furthermore, the enactment of the Land Act of 2010 revoked past “discriminatory barrier of access to land by married women and widows” (Ministry of Local Government and Chieftainship Affairs 2015, 13). However, “obsolete” customary laws are still prevalent despite being contradicted by these newer laws and the majority of Basotho men do not see women as their equals (Ministry of Local Government and Chieftainship Affairs 2015, 15; UNDP 2017). Furthermore, the political representation of women in Lesotho is still under 30% – the minimum level recommended by the Southern African Development Community (SADC) (UNDP 2017). In spite of this lack of political representation, one of the three commissioners for Lesotho’s Independent Electoral Commission (IEC) is a woman, and the Speakership of the National Assembly and the Governor of Central Bank of Lesotho are both women (UNDP 2017). However, negative perceptions and unequal gender norms still persist, and they “present a challenge to gender equality in representation and participation in public decision-making forums” (UNDP 2017, 9). Bhorat, Haroon. 2015. ‘Is South Africa the Most Unequal Society in the World?’ The M&G Online, 30 September 2015, sec. Analysis. http://mg.co.za/article/2015-09-30-is-south-africa-the-most-unequal-society-in-the-world/. Damane, Moeti, and Lira Peter Sekantsi. 2018. ‘Sources of Unemployment in Lesotho’. Modern Economy 09 (May). https://doi.org/10.4236/me.2018.95060. FAO. 2005. ‘Irrigation in Africa in Figures – AQUASTAT Survey 2005 – Lesotho’. http://www.fao.org/nr/water/aquastat/countries_regions/LSO/LSO-CP_eng.pdf. Fincham, Ashleigh. 2017. ‘Lesotho Administrative Boundaries Level 1’. WFPGeoNode. https://geonode.wfp.org/layers/geonode%3Also_bnd_admin1_a. Lesotho Bureau of Statistics. 2009. ‘2006 Lesotho Population Census: Analytical Report, Volume IIIA Population Dynamics’. Analytical Report. Maseru, Lesotho: Lesotho Bureau of Statistics. ———. 2013. ‘2011 Lesotho Demographic Survey: Analytical Report, Vol. I’. Statistical Report. Maseru, Lesotho: Lesotho Bureau of Statistics. ———. 2018. ‘Lesotho Census 2016 – Summary of Key Findings’. Maseru, Lesotho: Lesotho Bureau of Statistics. http://www.bos.gov.ls/2016%20Summary%20Key%20Findings.pdf. The World Bank. 2018. ‘Unemployment, Total (% of Total Labor Force) (Modeled ILO Estimate) | Data for Lesotho’. 2018. https://data.worldbank.org/indicator/SL.UEM.TOTL.ZS?locations=LS.